Unlike most CBD sources, our hemp & business are BOTH MAINE GROWN & local, and not tied to a corporate farm/business. We grow rice, hemp, veggies and strawberries. Our no-till, permaculture, and human powered practices ensure each plant gets the utmost care. Medicinal Hemp is about a lot more than CBD. Our Full Spectrum products, with terpenes and 90 other healing compounds, allow the adaptogenic, synergistic and medicinal effects of this herb to flourish. We believe, with so many benefits, this plant can be a bridge for more herbal remedies into mainstream medicine. Dawn from NY: 10/10 after using CDB for only 3 days I felt more energy, less sluggishness, slept better and had a spring in my step :-) I am excited to see the benefits of extended use. Anonymous – 9/10It was very helpful with managing my pain. Especially acute pain from injuries. I've just had surgery so I'm healing. I was also relieved to have positive effects from using it to help with an eczema problem that has been going on for 10 or more years! Our Genetics, Care, & Footprint: Our hemp comes from some of the best genetics in the USA. Combined with healthy soils & practices (1 of 3 MOFGA certified CBD hemp available), our plants have some of the highest CBD to THC ratios in the country. To minimize our footprint, we produce more CBD on ½ acre than many places do on 20 acres. Test & Certifications: Our batches are third party tested in Portland to ensure each batch meets our standards. Our kitchen is state certified. Our hemp is Maine state certified (MADCF) and tested below .3% THC. Our products will not get you high. 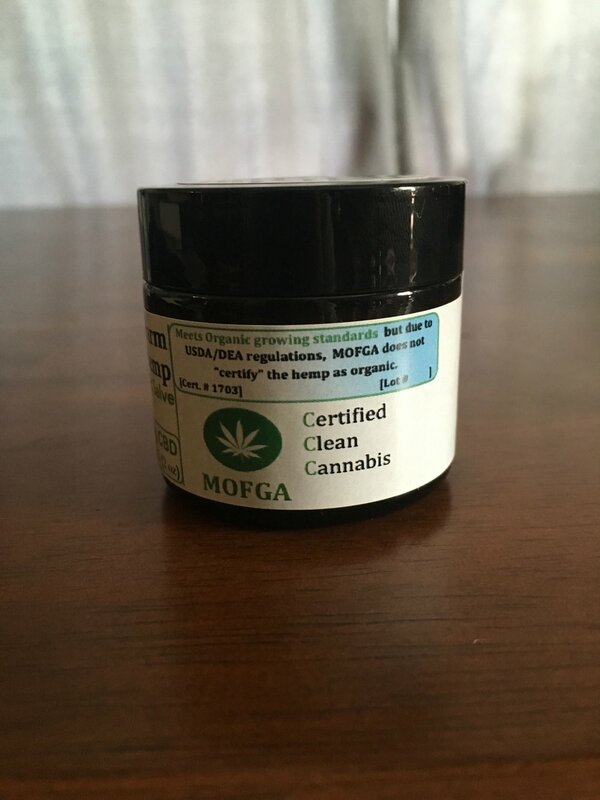 MOFGA certification #1703. Test result links coming soon. Research and Donations: 15% Plant material donated for the Opioid Crisis, Marginalized Communites & Medical Studies. Discounts for Severe Illness. Semi-analogous to the lymph and immune systems, our body produces its own cannabinoid molecules, that greatly resemble those found in hemp & marijuana. These endo-cannabinoids bind to ECS neurotransmitters, of which we have more than any other neurotransmitters. THC binds with CB-1 receptors which are mainly found in the brain (CB-1). This causes the “high” sensation. CBD, on the other hand, binds with CB-2 receptors as well as CB-1. CB-2 receptors are found all throughout the body and help explain why CBD is so powerful, and synergistic for human health & well-being. The terpenes and 90 other cannabinoids also have many of their own benefits, as well an help CBD be better absorbed and assimilated into our bodies. An integral piece of the body’s overall immune system the ECS stimulates your body to regulate, nourish, and heal itself. Furthermore it acts to rebalance things that are out of sync. In this way medicinal hemp is classified as an adaptogenic herb. For example, it is just as important to remember things as it is to forget, and just as important for nerve health to slow down over firing as it is to speed up under firing. In this way medicinal hemp is classified as an adaptogenic herb. So, if you use some of this in the evening, and it makes you tired, it might be because you could use some sleep! Remember there are over 90 others compounds in medical hemp beyond CBD and THC. Human powered, no–till care also presents its benefits in the terpene analysis and high balanced profile of the other cannabinoids. We believe it is this full spectrum that really creates synergistic benefits, as all the compounds interact with the body’s intricate endo-cannabinoid system. Enjoy the green color and floral aroma from your tincture and be reminded that this medicine came from a plant! Evidence suggests some terpene profiles help to lower insulin levels and suppress appetite, helping with weight loss and diabetes management. Other terpene profiles increase the absorption of compounds transdermally and increase circulation, allowing the medicine it accompanies to get into the body more effectively. Other compounds to take note of are CBN and CBG. CBN has amazing non narcoctic pain relieving effects, helps with nerge regeneration, as well of pain relief from traumatic memories (PTSD), and CBG has been shown to ease glaucoma and can have sleep inducing and antimicrobial properties providing people with a gentle easement to their pains internally and externally and aid in bone growth. Resource links coming soon. Tinctures - Dosages range from 3 drops to 3 full droppers. Unless you are an experienced user we recommend starting small and increasing if necessary. Use in a concentrated fashion, either directly under the tongue or slightly diluted. Some patients with severe illness will use more than 10 full droppers a day! If you take too much of either, the only side effect we are aware of is drowsiness. See benefits at top of page. Which tincture is best for me? Everyone is different and each extraction process also offers its own benefits and extracts slightly different compound profiles. We have loyal followers of each extraction type. Hopefully there will be more information on which extractions methods are best for certain people or certain ailments, and it often is just case specific. Our Alcohol Tinctures are made from an organic corn alcohol. This extraction follows the same method used in many herbal tinctures. In some circumstances it is great in the evening, as it can encourage rest. It has the fastest results & is best put right under the tongue. If you are new to alcohol tinctures we recommend slightly diluting it, as it can be harsh on some people’s mouths. Some believe alcohol can also penetrate into some areas of our bodies more easily than the coconut oil. Our MCT Tinctures are made using our CO2 distillate* and then expertly blended with MCT (medium chain triglyceride) coconut oil. Expect the full effects to kick in within 30 minutes. Also great for pets, children and those with alcohol sensitivities. 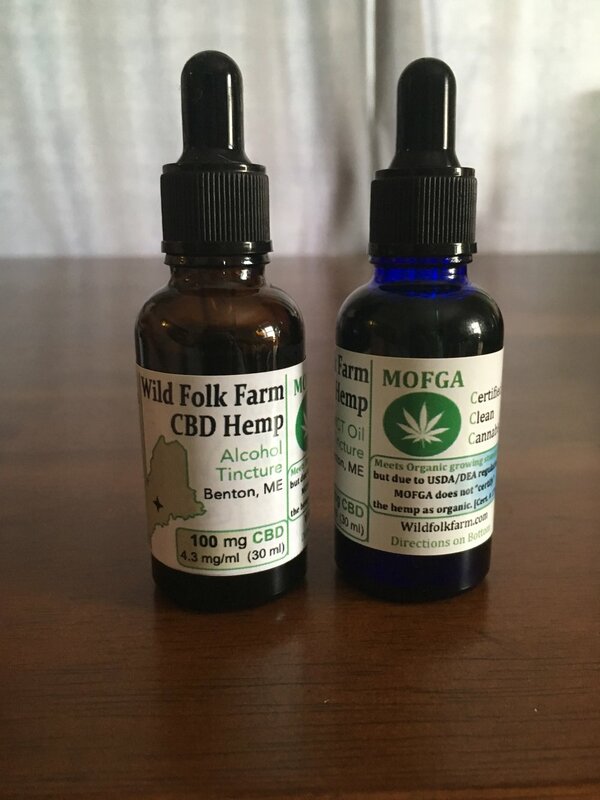 We recommend the MCT if you wish to experiment with increasing your dosage of a certain concentration to learn which dosage works best for your condition because taking many droppers of the alcohol tincture can cause slight inebriation. Salves - See benefits at top of page. Our Topical Salve is made directly from our flowers, leaves, and in the future, root balls. This method, where we cook the plant materials in the oils follows the same extraction processes as most herbal salves. Great for full spectrum benefits, especially when we introduce the root ball into the infusion in the upcoming months. In our Therapeutic Salve we mix our distillate* with the same organic oils. Good for those with sensitive skin that still want the benefits of direct CBD application to relieve cramps, pain & tension, as well as treat their skin to the rejuvenating benefits of CBD. It is easier for us to make this salve so if you don’t have a preference, we prefer that you order this, as we have found little difference in the efficacy of both salves, but for those passionate about the topical salve, don't hesitate to choose that. Industrial Hemp - These are tall, narrow, stalky plants. There is a lot of male and female pollen mixing, which results in seed formation and small flowers. The stalks are best used for textiles, insulation, rope etc. The seeds are very nutritious and high in fatty oils. These plants are very low in CBD, THC, Terpenes and other Cannabinoids. Medicinal Hemp – Also called CBD hemp. These plants have no psychotropic properties, but are very high in CBD and other non-pychotropic cannabinoids and terpenes . Technically the government defines hemp as a Cannabis Sativa plant that has below .3% THC when female flowers are mature. Unlike Medicinal Hemp, Marijuana is high in THC. However, like marijuana, with medical hemp, the genetics you begin with and how the plants are grown plays a huge role in how the plant interacts with your body (i.e. quality and care = efficacy). Plants are often grown outside, either as bushes or stalks. Coming soon - After using our products please fill out a survey online and receive a discount. This anecdotal evidence is so important to us as we move forward.